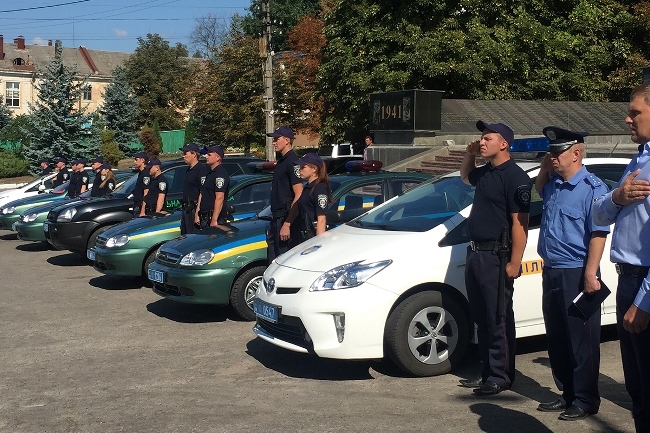 The District Police Departments of Vasylkiv and Obukhiv in Kiev oblast today launched local versions of the new response police. The launch was celebrated with lit de parade of new police vehicles and speeches by local heads of police and regional administration. A representative of the EU Advisory Mission, Mr. Joachim Peter, spoke at the occasion. Just like the pilot case of Sambir district police station in Lviv oblast the police units in Vasylkiv and Obukhiv are currently undergoing reforms to increase trust and cooperation with the surrounding local community. The response police is only the first step in bringing police closer to citizens and increase the publics trust in law enforcement. After this will follow implementation of new quality standards, new technical means and improved systems for policing. The Sambir district police station made headlines in June this year when it launched the pilot response police project. The success is now to be repeated throughout Ukraine, starting in the Vasilkiv and Obukhiv districts in Kiev and subsequently in the several districts in other oblasts. The EU Advisory Mission is confident that the new forms and methods of work will enable the police to start engaging in closer proximity to citizens and on a regular basis improve contact and visibility. The new methods will greatly cut the time it takes for the police to respond to citizens emergencies and contribute to a change of mindset that ultimately will enable more transparency and public scrutiny into how the police works and thereby give citizens real reasons to trust law enforcement.